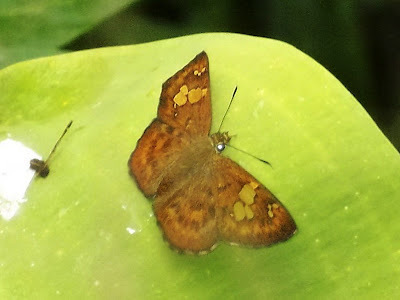 Adult upperside dark golden brown with semi- transparent spots; spots white in female and yellow in male. FW with 3 small, sub-apical spots ( the middle one the smallest), 4 disco-cellular spots ( the cellular spot larger and excavated, sometimes divided into 2 ), 2 round spots below them and brownish indistinct marks and outer marginal band. HW with a cellular brown spot, a discal curved band and marginal band. Underside similar but duller. Wingspan 40-46mm. 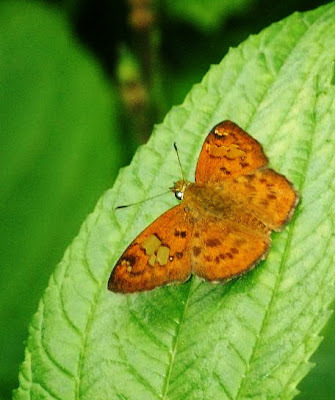 An inhabitant of moist, cool, dense jungles in the hills up to 2300m. visits flowers, bird droppings frequently and water rarely. Fond of basking in the sun on the upper surface of leaves close to the ground. With extremely rapid flight, it makes long lasting aerial sorties occasionally in shady clearings. 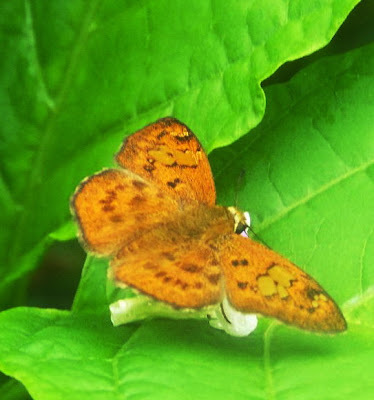 Greenish brown with black head. Body spindle-like with a segment with 8 long simple hairs besides a few branched hairs. Rejang land (Sumatra, of course ), India, Bangladesh, Nepal, Bhutan, China, Myanmar, Thailand, Malaysia and the Sundaland.